About Schmidt is About America. 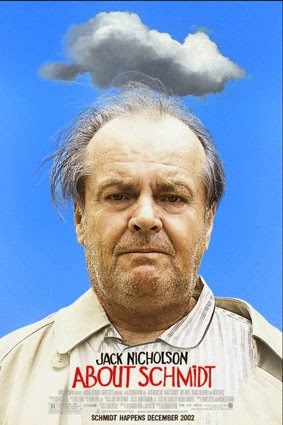 Jack Nicholson is front and centre in Alexander Payne’s 2002 dramatic comedy about a man coping with retirement and the loss of his wife. As Election became a bigger and bolder statement about democracy, About Schmidt is a reflection on much more than one man’s life. It manages to comment on the very definition of friendship and love. It tackles honesty and openness – attributes that surely define a successful marriage. Or can a 42-year marriage be based on a mutual understanding towards sensitivity and considered conversation? About Schmidt is told from the perspective of an American who has lived the dream and yet remains unsatisfied. Like the poster, a dark cloud hangs over this lone soul. Warren Schmidt (Nicholson) retires from an executive position in a life insurance firm. His send-off includes a speech from a young “hot shot” that seems to be more interested in introducing himself rather than bidding farewell to a valuable member of “Woodmen” insurance. Leaving the party, Warren speaks to his daughter who was unable to attend. 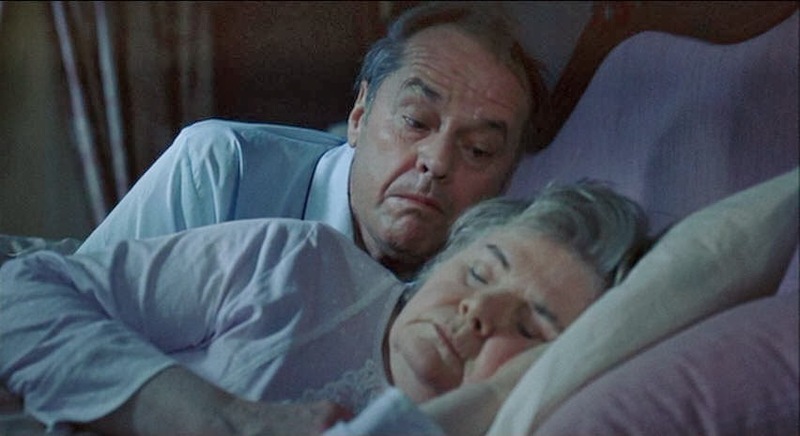 His wife, Helen (June Squibb), waits on him and keeps him “in check” before a sudden death in the home days later. But not before Warren has decided to send money, and a revealing letter, to Tanzania to support the life of 6-year Ndugu. These letters reveal Warrens true feelings; his frustration and anger towards what could be his son-in-law; how he has fallen out of love for his wife; how he fears death. After the death of his wife, he is on his own and has to figure out where he belongs in this crazy world. The letters to Ndugu is the literary glue that holds the film together. Not only does it offer us an insight into Warren’s world but it reminds us of the gross disconnect and injustice between western affluence and third world poverty. The term “first world problems” is bandied around on the internet as a play on Westerners complete lack of appreciation for the privileged society we live within. Warren’s complete lack of awareness towards Ndugu’s age and understanding is a hint towards our own selfishness in a consumer society. Warren Schmidt is in a unique, sobering moment in his life. Do we truly know Warren at all? Considering the specific set of circumstances between his retirement, his mourning and his detached relationship from his daughter, it is clear this is not Warren in his prime. Maybe the picture at the University of Kansas is his hey-day. By the same token, Helen is much more than a standard wife. She has clearly had her own frustrations and challenges within their marriage, but kept it hidden. Payne has managed to craft a film that hints at deeper stories and weighty themes a nothing is overt and bold. We relax in an ocean of thoughts and ideas that fester long after the film finishes. He pines after brutal honesty from his deceased wife – he wonders whether she was disappointed in him. On reflection, meeting the brash and bold – but brutally honest – Roberta Hertzel (Kathy Bates stealing every scene she is in), we realise that the considered demeanour of his wife suited Warren better than he realised. Framed amongst branded stores and restaurants in Nebraska and Colorado, About Schmidt reminds us of what America is – and what it may have lost in the process. Locations are separated by vast country that Warren road-trip’s through in his top-end camper-van. This beauty is ignored. Warren has enjoyed a successful life with a well-paid job, a loving spouse and an intelligent daughter. Yet he is ashamed of his mundane profession, despises his key-using wife and explicitly tells his daughter how he feels about her husband-to-be. The audience are left to consider who is truly at fault. Is it the old man and his selfish tendencies? Or is it the vast landscapes that separate families? And the tall buildings that look over cities to dominate the meaning of success? A child in Tanzania appreciates the $22 Schmidt sends, so we should appreciate the houses we’ve built for ourselves and the love we receive. 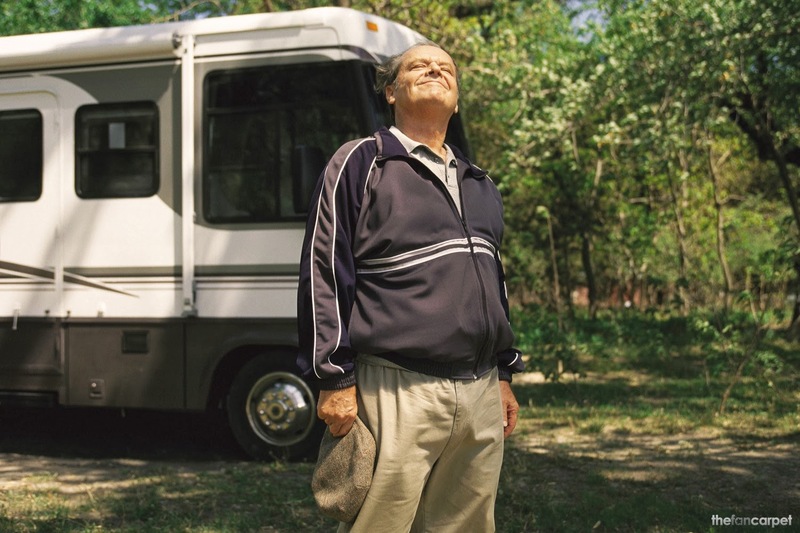 The challenges in later life is captured effortlessly by Alexander Payne and About Schmidt becomes the polar opposite of the youthful, ambitious folks in Election, as Nicholson’s Schmidt is past his prime – and knows it. A stunning follow-up and a thought-provoking success, About Schmidtis about so much more.